Overall, the results of the scenarios do not point to a sudden, dramatic decline in water availability. Risks of water shortages for human use and environmental needs are increasing, but it is possible to compensate through land-use planning, careful water management, and by reducing demand. These models are an extremely valuable tool for adaptation, and provide answers to specific questions about current and future water needs in different parts of the basinLand area from which water drains towards a common point, and the interdependence of water sources. Climate change, population growth, and expansion of the agricultural land base are expected to result in significantly increased water withdrawals from surface and groundwaterWater existing below the ground surface in aquifers sources in the Okanagan BasinLand area from which water drains towards a common pointThe Okanagan watershedLand area from which water drains towards a common point, or basinLand area from which water drains towards a common point, is a narrow strip that spans from Armstrong, British Columbia, Canada to the US border and includes five main lakes – Okanagan, Kalamalka-Wood, Skaha, Vaseux and Osoyoos – and surrounding mountains. The Okanagan BasinLand area from which water drains towards a common point includes all the land that feeds water to our big lakes, and is almost 200 km in length and 8,000 km2 in area. Kelowna, Vernon, Penticton and Osoyoos all lie within the Okanagan BasinLand area from which water drains towards a common point., especially during summer months. Competition for water in the basinLand area from which water drains towards a common point, particularly during the summer (e.g. when there are flow reductions in fish-bearing streams) will likely intensify in future. There is significant potential for conservation and demand-managementThe modification of consumer demand for water through various methods, such as financial incentives or education. to mitigate these effects, but demand management alone may not be a sufficient response to future changes. Augmenting water supply by increasing water storage capacity would help meet future water management challenges, although increasing storage is more costly than reducing demand. Key water sources include upland storage reservoirsArtificial lakes used to store water, groundwaterWater existing below the ground surface in aquifers, and main valley lakes. Storage reservoirsArtificial lakes used to store water require adequate protection for long-term water security. It will likely become more challenging to provide and maintain environmental flows, especially in late summer and early fall. Additional storage may be needed for this purpose. Management of upland storage reservoirsArtificial lakes used to store water will become more challenging as snowpacks decline, more winter precipitation occurs as rain, and snowmelt occurs earlier in the spring. These trends reduce the amount of water stored as snow for ongoing refill of reservoirsArtificial lakes used to store water and aquifers in early summer. With three consecutive years of drought, it will become more difficult to maintain current Okanagan Lake levels and adequate stream-flowsThe flow of water in rivers or stream channels in the Okanagan River downstream of Penticton. GroundwaterWater existing below the ground surface in aquifers is increasingly used as a water source as surface waterWater that flows in streams and rivers, and exists in natural lakes, wetlands, and in reservoirsArtificial lakes used to store water becomes fully allocated on some sources. Without regulation, groundwaterWater existing below the ground surface in aquifers use is likely to expand, which will lead to management challenges because surface and groundwaterWater existing below the ground surface in aquifers systems are interconnected. Current water licenceA licence issued by the B.C. government to store water, or to withdraw water from a surface water source for a particular purpose volumes may not be sufficient to satisfy demands on some streams in future, particularly on those with limited or no storage. The models are based on available scientific and water management information; however, the quality of that information is variable, and in some areas, particularly with respect to stream-flowThe flow of water in a river or stream channel, groundwaterWater existing below the ground surface in aquifers, actual water useVolume or rate of water diverted or withdrawn from a water body (eg a stream, lake, or groundwaterWater existing below the ground surface in aquifers aquiferAn underground formation that stores groundwater) for use by humans on the land surface. Actual water use is determined through direct measurement. Water demand is an estimate of actual water use., lake evaporationThe process by which water changes from a liquid to atmospheric water vapour - an essential part of the water cycle. and evapotranspirationThe combined processes of evaporation and transpiration, better information will improve the models. Most at risk for water shortages are water suppliers relying on upland storage reservoirsArtificial lakes used to store water. The full volume of water licences will not necessarily always be available – even for those drawing from main stem lakes – depending on weather conditions. Risk for all water suppliers would be reduced if reservoirAn artificial lake used to store water storage is protected and expanded. 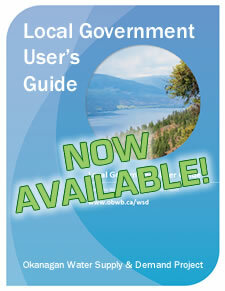 Visit the Okanagan Water Supply & Demand Viewer for interactive maps of water sources, water useVolume or rate of water diverted or withdrawn from a water body (eg a stream, lake, or groundwaterWater existing below the ground surface in aquifers aquiferAn underground formation that stores groundwater) for use by humans on the land surface. 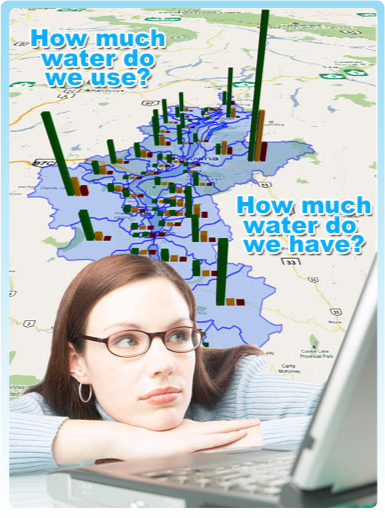 Actual water use is determined through direct measurement. 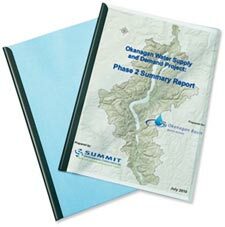 Water demand is an estimate of actual water use., and other results of the Okanagan Water Supply and Demand project. 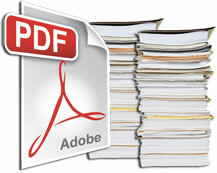 Click the logo to be transported to the viewer, or follow this link.